I met a lot of lovely people over our summer break while we were staying at Mackerel beach, it is such a small world and everyone is connected somehow. Next door to my sister in law's home is a very pretty little old original fishing cottage painted in the palest of blue with white washed timber. This home belongs to a beautiful lady named Rhylle. Rhylle's late husband found this fishing house twenty four years ago and over that time they have lovingly restored and added extra rooms to their holiday home. This house still has many of the original features of the old fishing house, but with Rhylle's elegant and feminine style it is today a very beautiful home and she has created a perfect holiday haven by the seaside. Rhylle swims every single day of the year and spends much of her time visiting her holiday home at Mackerel Beach throughout the year. 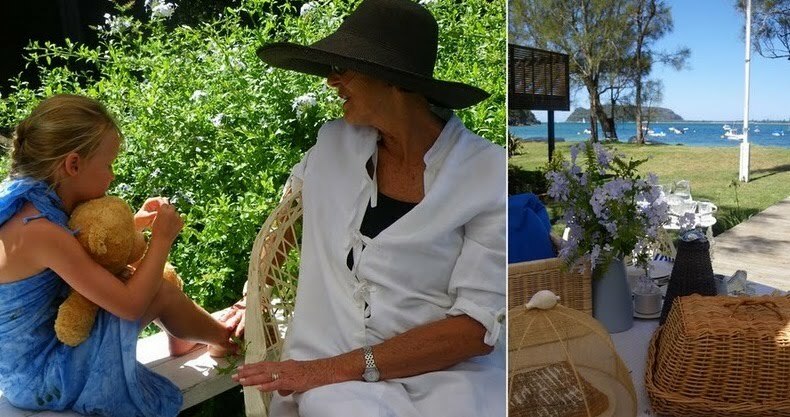 These last holidays, Rhylle brought her delightful little six year old granddaughter with her for some special one on one Grandmother - Granddaughter time together. It's hard not to gaze into these homes when you pass by them on the beachfront, each home has the most wonderful character and they're all unique in their own way. There are a few modern homes on Mackerel, a lovely old sandstone beauty perched high on the hill and many little old original 'Aussie style' beach houses. These homes are so gorgeous and are very sought after, especially when they are on the waterfront at Pittwater. I just couldn't resist asking Rhylle if I could take some photographs around her beautiful home and after a chat one morning we realised we knew many of the same people. Rhylle knew many of the women that I worked with in Sydney in my magazine days. I ended up photographing most of Rhylle's beautiful home over a couple of days and I also took some portraits very early one morning of her and her granddaughter on the beach, (to come soon). But I must say this table setting, with all of Rhylle's wonderful treasures was my very favourite settings this Summer. Just look at these chairs, they're absolutely amazing, they normally sit inside her kitchen but I had to bring them out for this shoot, there is also a table to match. The blue flower on her deck was in full bloom and a perfect backdrop, so of course everything just had to be blue and white and Rhylle's home was full of interesting things to use. I especially love the deep blue woven coffee pot and all of her cane baskets. Being a lover of all things blue and white....everything was just perfect. Oh and I must also mention, the light beam that appears in some of these photographs above just appeared out of nowhere, it looks like we had an extra lovely guest with us for lunch. Thank you again for all your amazing & kind comments from my last post, I wish you all a wonderful week and happy times with your loved ones on Valentine's Day this coming weekend. Oh how we're loving seeing your warmth! This looks like a delightful day. I'm following your blog and I love your work. I was really happy about your meeting with Minna Mercke Schmidt, another artist that I like and follow. You've a beautiful family and a gift. This is like a dream -- to those of us stuck in the Northern Hemisphere with rain, snow and ice! Lucky you. The photos are fabulous as usual. I live in Utah and this post makes me ache for warm weather and water. Beautiful photos! Thanks for sharing. Just fabulous, relaxed images Coty. Very much the Aussie beach-house isn't it! You've captured it perfectly. Sharing this with my friends on facebook tonight. We had one incredibly warm day yesterday...such a tease! Taylor and I spent the whole day on the front porch with books and artwork. It was heaven!